Mitsubishi Motors Philippines Corporation (MMPC) bags four awards at the recent 2016 Car of the Year (COTY) and Truck of the Year (TOTY) – Philippines. An awards night was held last November 21 at the Rockwell East Tower in Makati City to proclaim the vehicles that bested in their particular categories out of the total of 72 entries. 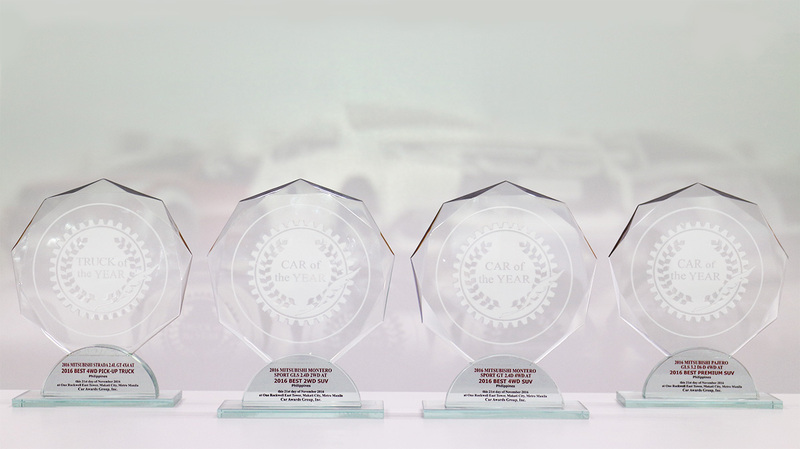 After rigorous tests conducted by the members of Car Awards Group, Inc. (CAGI), the Montero Sport GT 2.4D 4WD AT, Montero Sport GLS 2.4D 2WD AT, Pajero GLS 3.2 Di-D 4WD AT, Strada GT 4WD AT dominated their respective categories and were declared as the winners. Coveting the category awards were models that are among Mitsubishi’s bestsellers. The all new Montero Sport is the first in its class to have an 8-Speed automatic transmission with Sports Mode which is designed for quick sprints, relaxed highway cruising and best of all excellent fuel efficiency. Both the Montero Sport and Strada GT are fitted with the world’s first clean diesel engine equipped with Mitsubishi Innovative Valve timing Electronic Control (MIVEC) technology. The new 2.4 liter 4N15 diesel is now Euro 4 compliant and is now cleaner, more powerful and more efficient. Compared to traditional diesel engines, the 4N15 engine boasts of a low compression ratio, thus reducing fuel consumption, smoke and Carbon Dioxide (CO2) emissions as well as maximizing the output of the Variable Geometry Turbo (VGT). Meanwhile, the new Pajero features a more robust 3.2 Liter 4 in-Line 16 –Valve DOHC Diesel engine which is now complemented with a Variable Geometry Turbocharger or VGT. Apart from their highly efficient and powerful engines what makes these models truly award-winning are their best in class amenities and safety features. These recent recognitions validate the world-class quality and the value for money of the vehicles that MMPC offers to the Philippine market. COTY and TOTY are organized by the Car Awards Group. Inc. (CAGI). It is among the prestigious and highly anticipated awarding event by the local automotive industry. CAGI annually conducts consumer-oriented testing to give recognition to outstanding new models available in the local automotive market. Eligible vehicles are subjected to a qualitative and technical tests to fully scrutinize the most deserving vehicle to win the award. After the technical and qualitative tests done by CAGI, the data were handled by the internationally renowned auditing firm, KPMG R.G. Manabat & Co. to ensure that all winners are indeed deserving of the awards.